I like the way the back wall finish works with the room. Are your speakers HG cherry? I also LOVE the finish. Yes high gloss cherry finnish. Very clean and tastefully done. A very nice clean look Philippe! Amazing. The speakers really tie the room together. I like the way the room is decorated. 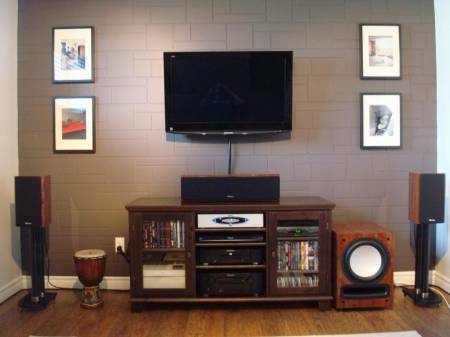 The speakers blend in well with the finish you chose for them. Philippe you created a gorgeous room that blends and flows extremely well, congrats!